I love a productive day. I get that "nesting" feeling with the turn of each season and kind of go through the house with a vengeance. It truly makes me feel good to organize a closet, scrub down the fridge, or steam mop the floors. I know it may sound crazy to most people, but I enjoy having everything neat and organized, at least until the next herd of teenage boys passes through. We organized our attic and really purged it out a few weeks ago. I tried to look at each item and honestly ask myself "am I really going to use his?" Some of the times the answer was yes, a lot of the times it was no, and even though it was hard to get rid of things (I donate a lot of my decorative items to my cafeteria at work so I still get to see all my stuff, lol) it feels so good knowing that our load is lighter, and we really are keeping only the things we truly love. I've also been putting a big dent into the food we had stored in our 2 freezers. They got a purge too. Luckily I have a vacuum sealer that we use quite a lot and it really saves a lot of space. So fall cleaning and crafting is under way. I'm ready to make warm and hearty meals again. I'm ready to fire up the oven and fill it with stews and pies and cookies. What better time to start then right now? My mother-in-law, who is always on the look out for interesting recipes, called me when she saw this recipe from Mr. Food on her local news station. Potato Chip Cookies. Strange, but hey, I like strange, so it works for me. She also knows that Evan loves the sweet and salty combination. I'm kinda fond of it myself, so I though, what the heck and gave them a try. Now let me say this....there is a POUND of butter in these cookies so you may want to half them and save yourself the coronary bypass, or just make the whole thing like I did and give most of them away. Whatever works for you. Evan happens to love those Pillsbury cookies that you just throw on a cookie sheet and bake. You know the ones with the little hearts in the middle, or a flag or a snowman? Yup, he lives in a house with a continual flow of home baked goods and he would hands-down, on any given day, eat those in favor of anything that lovingly comes from my oven. Where have I gone wrong? 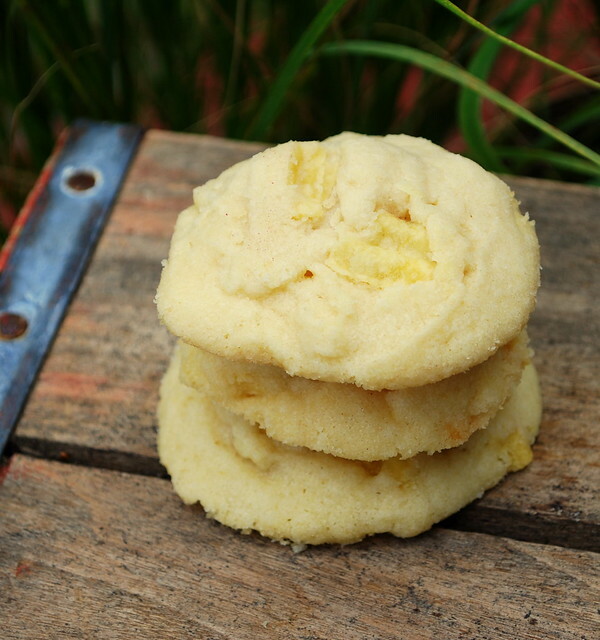 In any case, if you like buttery, sugar cookies then you will love these. The potato chips get a little but chewy, but in a good way, not in a soggy "oh the chips have gone stale" way. In a large bowl cream the butter and sugar. Add the vanilla and then the flour, mixing until well blended. Stir in the potato chips and mix well. Drop by rounded teaspoons 2 inches apart on a cookie sheet. (No need to grease it, but I used parchment, cause, well, I always use parchment). Using a fork flatten each cookie a little (I forgot that part - OOPS!). Bake 20 – 22 minutes or until light golden brown around the edges. Let stand 5 minutes then remove to wire rack to cool completely. Sweet and salty foods are my favorite! Bookmarked! Baaaah! This made my miss my mama. 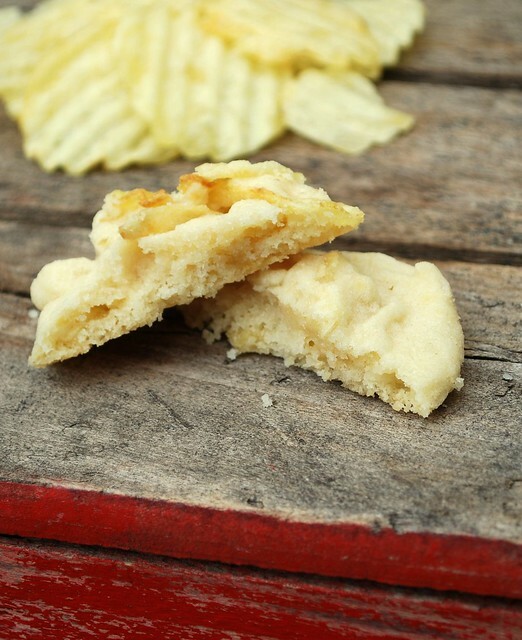 She is a tried and true fan of potato chip cookies but would never share her recipe. I can now challenge her to a cookie-off. In that scenario - everyone wins. I saw a link to you on Pinterest and had to try these. Really good with milk and coffee! Thanks for the recipe. Yum! Sounds really tasty..the sweet and salty...now, if you add a bag of chocolate chips to the recipe...that would be AWESOME!!!!!! I like your version a lot. I'm going to try it, and see if I like them better than the ones I made for my husband. Try dusting with powdered sugar when cooled... AMAZING. My mother made these all the time growing up. Try dusting with powdered sugar with cooled.... amazing! My mother made these when i was younger and it makes me miss her every time I make them. Years ago, a friend served these to us when we visited, she got her recipe from the back of a C&H Brown Sugar box. They were so delicious!! I think they would be similar to these, except for brown instead of white sugar. I just made these today for Christmas Eve. Dipped some of them in melted Nutella and let harden. May add bacon in the recipe next time. Delicious. Thanks! !